Female Players wishing to be considered for PlayStation 4 National Premier Leagues Squads will be asked to register their details below. The club’s NPLW Technical Director and Team Coaching Staff will initially screen the player expression of interests and contact players directly with confirmation of Player Identification dates. Senior Women will be invited to attend towards the end of October, dates to be finalised shortly. Please register your expression of interest so that we can keep you informed. Attendance for the player and at least one parent (If the player is Under 18 years of age) to a mandatory Induction Session – scheduled for Early February. To liaise with specialist coaching staff (ie: Conditioning Coach, Club Physio, Goalkeeping Coach) regarding player performance or to enlist their services within team training sessions when required. 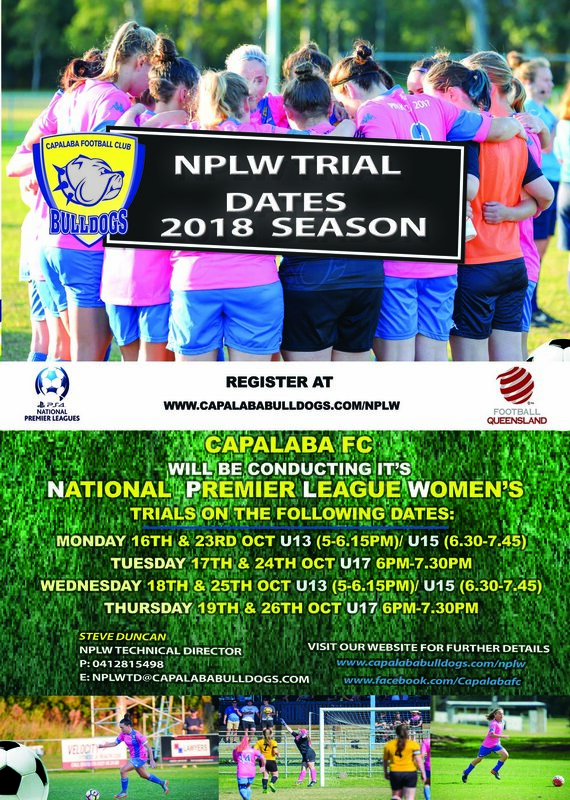 Fee's for Capalaba FC NPLW Program will be announced shortly. If selected, an initial NON-REFUNDABLE deposit will be required by the last scheduled Talent ID / Trial date. PS4NPL Program positions will be forfeited and offered to another identified player if a commitment is not made by this date. By submitting your information we will have contact details to keep you informed as to club trials and and relevant events relating to this team.